A blustery beginning ignited the first day of Treasure Island Music Festival 2016. Early on in the day, the Pier, which housed the ferris wheel and several vendors, shut down after high winds and a report of one injury to a woman. Despite all of the havoc the weather brought, the crowds and the handful of artists there to perform continued on. One of the performers on earlier in the day was Bay Area based DJ Polish Ambassador. He played a mix of both original music as well as covers to a crowd that mostly huddled together to shield themselves from the wind that whipped up around them. It was during his set that the announcement was made of the first initial delay to the festival. The crowd at the Bridge stage was informed that due to the weather and most of the artists being delayed because of it, all the set times of the performers were to be pushed back by one hour. Young Thug originally slated to come out 4:30 p.m. was then pushed back to 5:30 p.m. To make up for the delay, Polish Ambassador played an extra hour of his set. By the end, more people were paying attention to the performance artists in clown makeup and old tyme British police uniforms than Polish Ambassador. 5:30 p.m. rolled around and there was still no sign of Young Thug. An antsy crowd had begun to form and just as the stage lights came to life, Queen of the Bay and Kamaiyah walked out onto the stage. In lieu of Young Thug, these artists formed a supergroup and played for the crowd for a little over and hour and a half. It was at this time that the rain and wind were at its peak. As one concertgoer ominously put it, “It’s here.” Much to Kamaiyah and Queen of the Bay’s credit, they donned their fluorescent ponchos like the rest of the crowd and played one of the most energetic sets despite the downpour and wind that whipped the rain up into a giant, soaking cyclone. After Queen of the Bay and Kamaiyah finished, both the Bridge stage and Tunnel stage were empty. Treasure Island’s official twitter read, “Weather happens :/ We’re having some delays with artist performances due to the rain. Thanks for hanging in there. Stay Tuned for updates.” An hour later there was another message stating that they were prepping the stage for “Thugger” and shortly after, Young Thug finally made his appearance. At this point, much of the crowd had dissipated and Young Thug played to a much smaller, but drenched group of people. 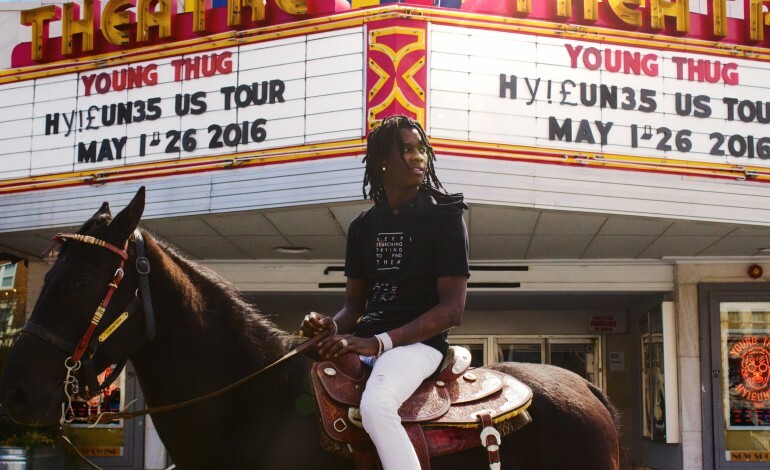 When Young Thug finished, both of the stages went back to being empty and the promise of an amended schedule was sent out over the twitter-sphere. Those who remained, patiently waited for the release of the artists who would close out the festival and shortly after 8, the remaining lineup was released. Everything remained the same apart from the late start of each band’s set and the absence of the band Flight Facilities who were unable to be there “Due to rain” according the festival’s official twitter. The rest of the festival is scheduled to continue and has prepared for further weather interferences. How to Dress Well began their set shortly after young thug ended his. They announced to the crowd that “35” monitors that they use, had been damaged and they continued on with a much more mellow performance. During this time, the rain had more or less stopped and while the wind still kicked up water off of tarps, concert goers danced and slid in the mud, much of them leaving behind shoes that were claimed by the watery, muddy pits that had formed all around the festival.